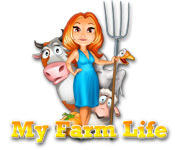 One minute Lisa is signing a contract to be the star of a new show, and the next she's knee-deep in chores as she starts taping the first episode of My Farm Life! Plant and harvest crops, milk cows and shear sheep, and purchase equipment to produce the goods Lisa's customers want, all while smiling for the cameras. With the help of a local merchant and three super-powered assistants, Lisa should have no trouble meeting her goals in this fun Time Management game! Search a mysterious estate and find a brilliant and mysterious inventor in Syberia, Part 1! Experience the first part of this incredible trilogy!